In an attempt to balance the ten gloomy points with which I ended Part Two, I will finish with ten observations that at least hint at possible solutions. 1) We should recognize that all wealth comes from the earth. Bearing this mind, the most ethically sound policy, in theory at least, would be to share that wealth as evenly as possible amongst the world’s population. While accepting that true equality is not possible in the real world, we should at least aim towards a fairer distribution of the world’s wealth, both globally and within nations. This would obviously involve a move away from the extreme form of free-market capitalism that now dominates most advanced economies towards what one might call market-oriented socialism, combining egalitarian principles with capitalist drive. 2) The best way to reverse the trend to inequality is through the creation of jobs. Although some redistribution of wealth through taxation should be a part of the process, the main aim should be full employment, or as close to such a thing as possible. Work is the source of all value; it is only through work that the natural wealth of the earth can be transformed into real wealth for the people. It is only through work that we gain the opportunity to ‘earn’ our share of the world’s wealth. We must therefore shift the focus of the economic system away from profit for the few towards jobs for the many, away from productivity and cheap goods towards sustainability and the well-being of future generations. 3) For free-market capitalism to work in a truly global marketplace, workers would have to be free to move to where the work is. This is of course impractical, which is one of the reasons why capitalism isn’t working any more. We need to reduce the competitive element between nations so that the focus can be on creating jobs everywhere, and not just where labour is cheap and unregulated. 4) Globalization is here to stay – there is no going back to nationalism and isolation. National borders are an artificial concept that should be seen as an administrative convenience rather than dividing lines between different peoples; the destiny of the human race is surely a matter for everyone. So it follows that the global marketplace requires a global authority to oversee policy and regulation, especially concerning the environment. 5) Such a global authority could go some way to solving current problems associated with the rise of global corporations. We have seen how large multinational banks and other businesses are able to avoid national jurisdiction with regard to regulation and taxes. If world leaders can agree on certain rules regarding trade and taxation, it will be much easier to end the current practice of registering businesses in tax havens and hiding the wealth of nations in offshore bank accounts. 6) This same authority could also introduce and oversee a global central bank that issues a global currency – a currency that would be linked to genuine wealth creation through a commodities index, a successor to the gold standard. This would restore true value to money and remove the distortions arising from the dollar’s dual role as a national and international currency. Such a global central bank could oversee a process of debt forgiveness and restructuring, while a global currency should end most of the problems associated with currency speculation. 7) Finance should be scaled back down to a level that reflects its status as just one of several useful services; less speculation and more public banks and credit unions, with real bank managers who have a stake in the local community and can get to know their customers. We can dispense with the gambling culture of the shadow banking sector, as it serves no useful purpose and is part of the problem. 8) While recognizing that a greater degree of regulation is necessary, it is vital to keep those rules as simple as possible. The same goes for tax systems. Complexity is bad for everyone, except perhaps lawyers and accountants. It is mostly because of excessive complexity that lawyers and accountants find ways to avoid taxes and regulations. 9) It is essential for all government and business to be completely open and transparent, to banish all undue influence and corruption. This would require an end to the common practice in some countries of political parties being funded by private individuals and corporations, a process that favours the wealthy and encourages crony capitalism. It also means that the democratic process, as well as moving beyond national borders to encompass a global authority, should also be strengthened at a local or regional level – in the real communities, where people can make their voices heard, and where true democracy has its roots. 10) Finally, we must return to the real values of real industry by giving greater priority to the wealth-creating sectors, while at the same time recognizing the need to move away from fossil fuels and finite resources towards those raw materials that are sustainable and less damaging. By directing more of the accumulated wealth of past industry towards genuine investment in research and job creation, especially in the fields of renewable energy, organic agriculture and ecologically-sound construction, and away from the current obsession with making money from money – which is ultimately impossible anyway – we will increase our chances of solving the world’s problems. We appear to have reached a critical stage in the development of civilization. Having invented the internal combustion engine and the traffic jam, we have unwittingly set in motion the process of global warming, and now we must break our addiction to fossil fuels or risk the unforeseen and unpredictable consequences. In addition to this, we have already spent some of the profits of future industry in a futile attempt at making our lives even easier, and must now make repayments out of reduced earnings, thus becoming poorer. We thought we could prosper without effort, make money from money, get something for nothing. Not surprisingly perhaps, this turned out to be an illusion. So now we face the daunting task of reducing our dependence on oil while at the same time distributing the world’s natural wealth more evenly. Linked to this goal, we have to reverse the destructive trend towards greater financialization and the increasing concentration of power in the hands of a few dominant global corporations, the result of which has been a decline in real industry and rising inequality. This will involve greater and more effective regulation, the development of renewable energy supplies and the creation of more real jobs. 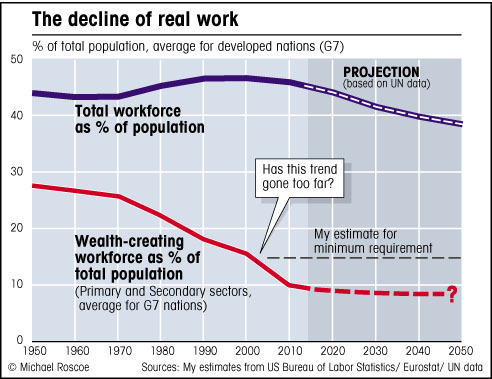 By this I mean jobs in the primary and secondary sectors of the economy in particular, because, as I attempt to illustrate with my final chart [see below], the root cause of the developed world’s problems is that not enough people are doing the right kind of work any more. We have to face up to this simple fact: the easy days are over. We will never again be able to achieve such a rise in material prosperity as occurred in the second half of the last century; it would be a physical impossibility to create so much wealth for so many people, even if it was desirable, which from an ecological point of view it obviously isn’t. The more people on this earth, the smaller each person’s allocation of the earth’s natural wealth must be, especially if the rich minority continue to grab an ever bigger slice. However difficult it might seem, we have no option but to change the system. 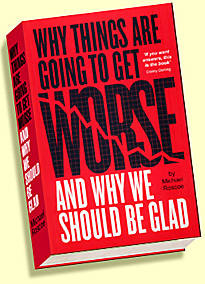 There is the possibility of a better world than the one we are living in now – a more equal world – but it will require a change of priorities away from productivity and growth towards jobs and sustainability; an acknowledgment that the well-being of our grandchildren is more important than immediate self-gratification; that happiness and prosperity are not dependent on the continuous accumulation of material wealth, but are totally dependent on the natural wealth of the Earth. It will also require more co-operation between nations and a greater degree of supranational regulation; a recognition that, despite our separation of the world into developed and emerging economies, rich and poor, west and east or north and south, there is really only one world, and we are all in it together.